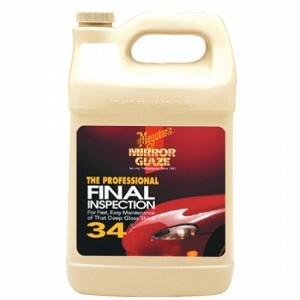 Meguiars Final Inspection® Cleaner (i.e. Meguiars Quik Clean Marine in bulk) is a fast, mist-on, wipe-off detailer for a deep glossy shine. Its high lubricity formula removes dust, fingerprints, light contaminants and is ideal to evaluate paint repairs, or to look for surface defects. Meguiars Final Inspection® Cleaner (i.e. Meguiars Quik Clean Marine in bulk) is a fast, mist-on, wipe-off detailer for a deep glossy shine. Its high lubricity formula removes dust, fingerprints, light contaminants and is ideal to evaluate paint repairs, or to look for surface defects. It's a paintable, body shop safe formula. Perfect for spot cleaning when you don't have time to clean the entire boat. Cleans without scratching while leaving a glossy finish making it perfect for use after a day on the water, or between regular washing.